What is Active Aging, Inc.? Active Aging, Inc. is Crawford County’s Area Agency on Aging, and was established in 1974. Before you decide this isn’t anything you need to know about, consider this- we all know someone who is actively aging, so please keep reading. 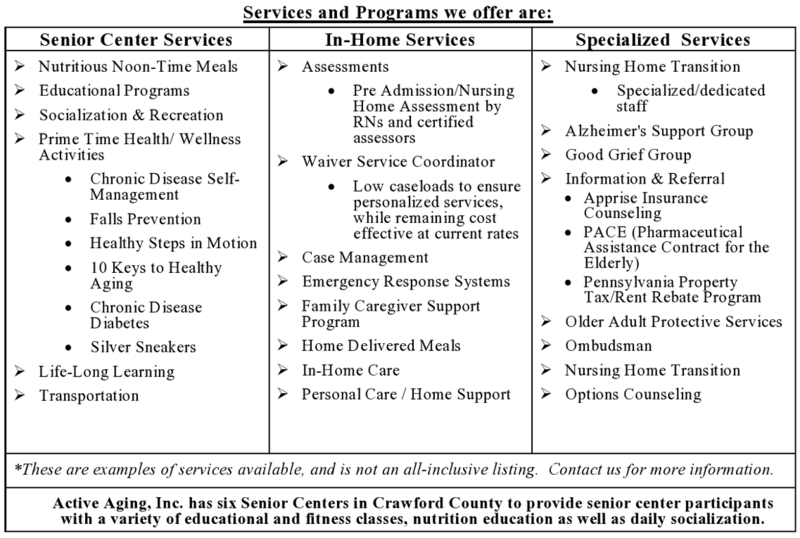 Below you will find a listing of all the different services we offer to those residents of Crawford County who are of the age 60 or over. We are your neighbors, members of the same communities you live in such as Meadville, Linesville, Cambridge Springs and Cochranton, just to name a few. We are the people you see in your grocery stores and pharmacies. We know how unique Crawford County is, and are familiar with the everyday benefits and challenges of living here. Many of our staff have provided over 20 years of service to Active Aging, and everyone who works here is dedicated to ensuring that our consumers have access to what they need. If you or anyone you know needs assistance, please feel free to contact us. We are here for you.